Over the years I’ve tried a large variety of painting equipment, from brushes, painting knives, and paints, to mediums, canvases, boards.. e.t.c, and I’ve found that on whole all of the good quality brands/types work well, and it’s really just a matter of personal taste which you use. The one thing that I would advice everyone to try however, is a glass palette. 1) It’s easy to clean with a paint scrapper ( seconds ). 2) It has a ultra smooth surface to mix your paint on. 3) You can effectively make it whatever colour you like, by placing coloured paper/card beneath it. You can even print out a tonal scale and place that beneath your palette to use as a reference when mixing. 4) It’s just about indestructible. 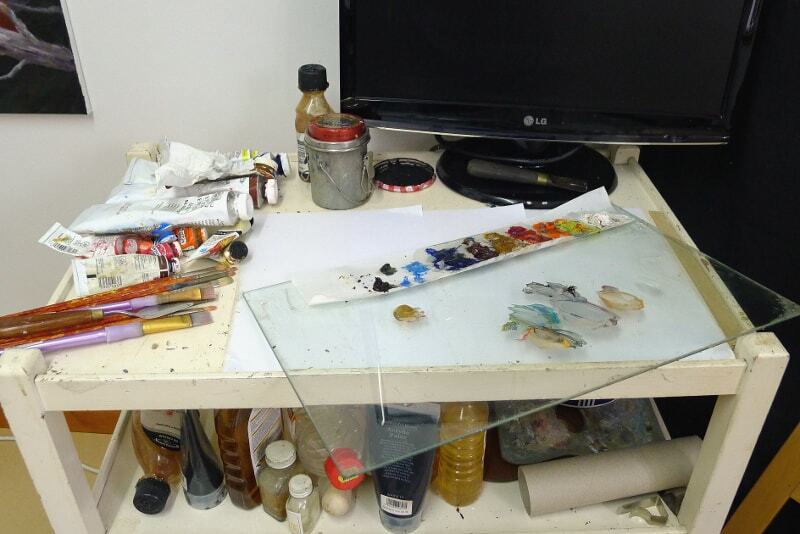 You can of course buy a glass palette from a art suppliers, but you can also make your own much more cheaply. Your local glass supplier will sell tempered glass, and when you ask them to cut a piece to your desired size ask them to sand the edges for you as well. NB. If you make your own glass palette you must use tempered glass. DO NOT use frame glass or ordinary window glass, this is brittle and liable to break and harm you. White card placed beneath my glass palette. I use a 18 x 12 inch piece of glass that was originally a shelf from a household fridge, my mother’s fridge in fact ( it’s okay, the fridge had broken and was being recycled, I didn’t just eat all her veggies and steal the shelf ). 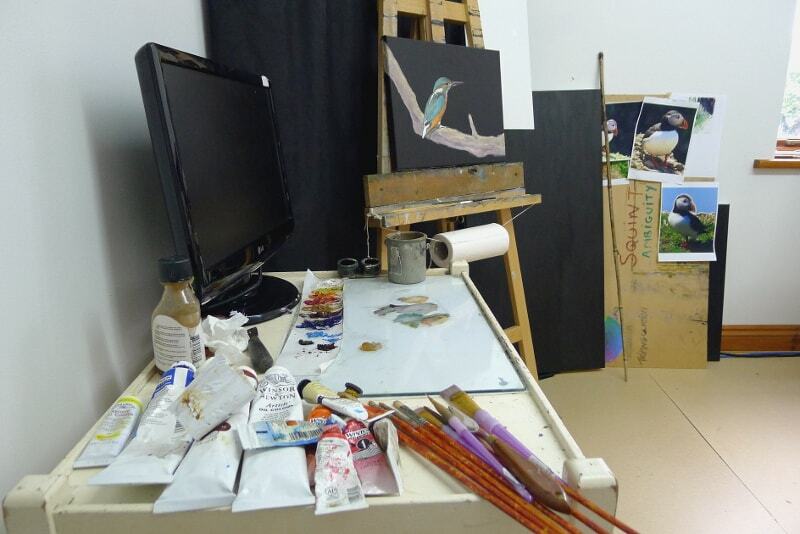 Try and use the largest palette and you can accommodate, if you have room for a 3 foot square palette, great! …the bigger your palette, the more space you’ll have, and the more space you have, the more freedom that will give you to mix up plenty of paint. A lot of artist, especially beginners, simply don’t use enough paint. Tempered glass is quite thick, and the edges are rounded, smooth and safe to hadle. Instead of squeezing out paint directly onto the palette, try taping a strip cut from a disposable paper palette onto the glass, and place your paints out on that. This way, when the paints go hard or get too polluted and messy you can simply pull off that strip of paper and throw it away, before taping on a fresh strip and squeezing out some fresh paint. Using a tonal scale beneath as a aid to colour mixing. 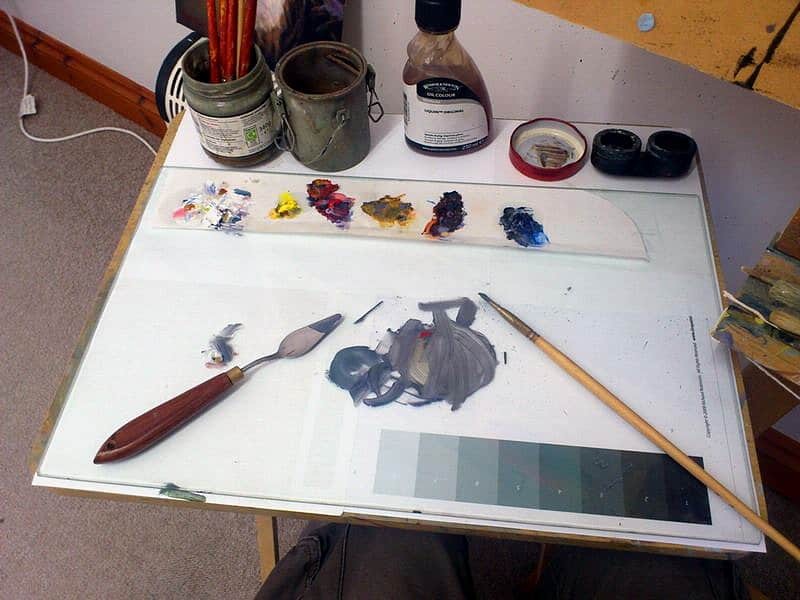 So if you’re struggling to judge the colours you’re mixing on that dark wooden palette, or tired of mixing paint on top of old dried up paint because you never quite got around to cleaning your palette properly after your last painting session, give a glass palette a go.